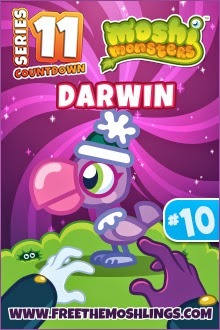 Darwin is number 10 in the Series 11 Moshling Countdown. It’s hardly surprising Dithering Dodos are so rare because they can’t decide if they are coming or going. In fact these incredibly indecisive Moshlings can’t even decide if they can fly, and can often be seen dithering around towering ice ledges preparing to jump… before changing their minds. Again! Habitat: Take a hike to the Frostipop Glacier and you’ll probably find a flock of Dithering Dodos walking around in circles, trying to decide what to do. Likes: Cosy beanies and beak polish. Dislikes: Sailors and the smell of stuffing.